Veneers are one of the most popular cosmetic treatments. See how our porcelain veneers can give you the beautiful smile you deserve. If dental issues such as chips, cracks, stains, or gaps are keeping your smile from looking its best, porcelain dental veneers placed at the Beverly Hills and Santa Monica area office of Dr. Jonathan Rudner can dramatically improve your appearance in only a few visits. By fitting custom-designed ceramic sheaths over the fronts of your teeth, we can effectively mask and conceal any discolorations, chips, and other imperfections, and by using veneers as instant orthodontics we can even provide the appearance of straighter teeth without braces. Porcelain dental veneers are ultra-thin, tooth-colored ceramic laminate shells that are bonded to the fronts of your teeth in order to conceal aesthetic imperfections and give the appearance of a healthy, natural-looking smile. Dental veneers are a more conservative treatment than restorations such as dental crowns, preserving more of the natural tooth structure while creating strikingly dramatic aesthetic improvements. The high-grade ceramic used in the veneers is very resistant to chipping or staining, so your new smile will be durable and long-lasting. 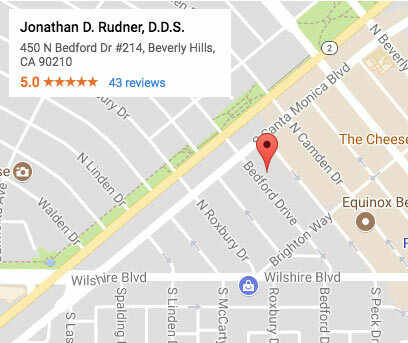 The first step in obtaining a new smile with porcelain dental veneers is to schedule a consultation at the Beverly Hills and Santa Monica area office of Dr. Jonathan Rudner. Dr. Rudner will assess the condition of your teeth as well as your overall dental health. He will then help you determine whether porcelain veneers are the ideal treatment for providing the results you want, or whether you might benefit from one of the many other cosmetic dentistry treatments he performs, such as Invisalign®, dental implants, teeth whitening, or dental bonding. If you decide to proceed with having veneers placed, Dr. Rudner will thoroughly discuss your options with you and help you plan exactly how you want your new smile to look. Next, your teeth will be prepared for your new veneers by lightly buffing the surfaces to remove about a half-millimeter layer of enamel, and a mold will be taken of your teeth to create an impression that will be used in crafting your new veneers, ensuring that they will precisely match your teeth. You will be fitted with attractive temporary veneers to wear while your custom veneers are fabricated to our exact specifications. Finally, once your new porcelain veneers are complete, you will return to our office, the temporaries will be removed, and Dr. Rudner will place and adjust your new custom dental veneers. He will take care to color-match your new veneers accurately before bonding them in place to ensure that your veneers will be indistinguishable from your natural teeth, providing you with an entirely natural-looking, beautifully attractive smile.